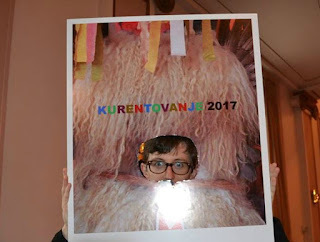 I had another blog post planned for today, but Kurentovanje was so much fun yesterday I needed to share everything that happened at the event. 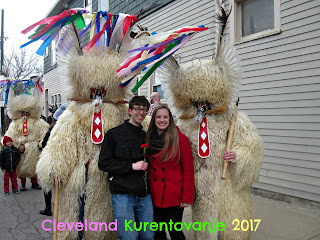 I found out about the Cleveland Kurentovanje event on Facebook earlier this week and prior to seeing the event shared by Cleveland Night Market. We went into this event kind of blind, we had no idea how to pronounce Kurentovanje (we know now!) and did no research outside of looking at the Facebook event the Slovenian National Home created. 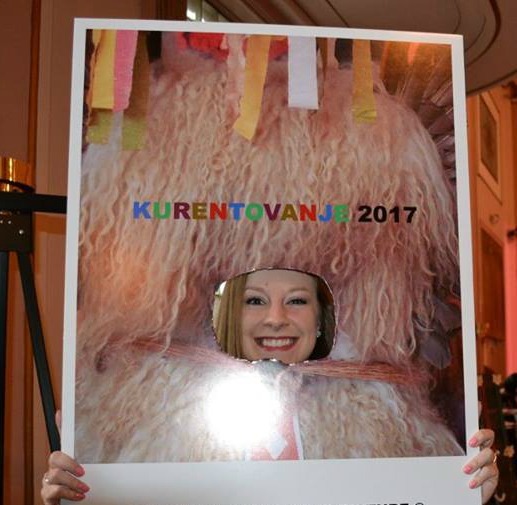 There was a schedule of events available that told the history of Kurentovanje which originated in Ptuj, Slovenia about 55 years ago. 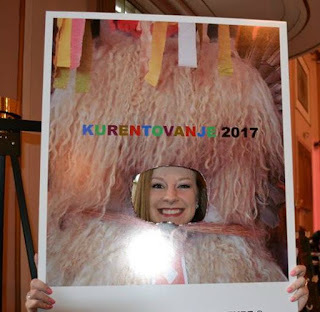 The event always takes place before Mardi Gras and in Slovenia Kurentovanje draws 100,000 people yearly with 800 Kurents marching in the procession. The Kurents wear sheepskin garments and have a chain of huge bells hanging around their waist. The clanging of the bells helps chase away winter. The Kurents also have a furry hat with ribbons, and a long red tongue. Completing the ensemble is a club carried in the Kurent's left hand. We arrived at the Slovenian National Home at 11:00 and as promised there was plenty of parking, I hate parking in Cleveland and love when there is ample, easily accessible parking. There were people outside of the Slovenian National Home to direct us on which doors to use and when we stepped inside, there were already quite a few people. Dave and I set-out in search of coffee and ended up at one of the bars which is kind of the same thing. Dave tried a Lasko and I ordered mulled wine (not pictured). Colorful Kurentovanje signs were all over the Slovenian National Home. It was time to celebrate! The event was cash only and we did not have enough to purchase a Slivo Shot, but there's always next year. In the main hall there were quite a few vendors ready to get everyone in the Kurentovanje spirit. 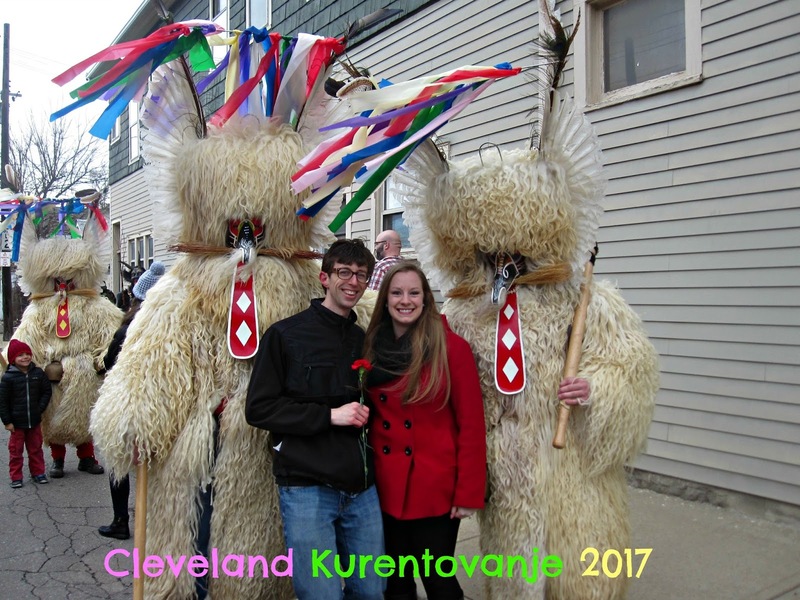 We took these Kurent photos at the Slovenska Pristava (a private club for Slovenian Americans in Geneva, Ohio) booth. 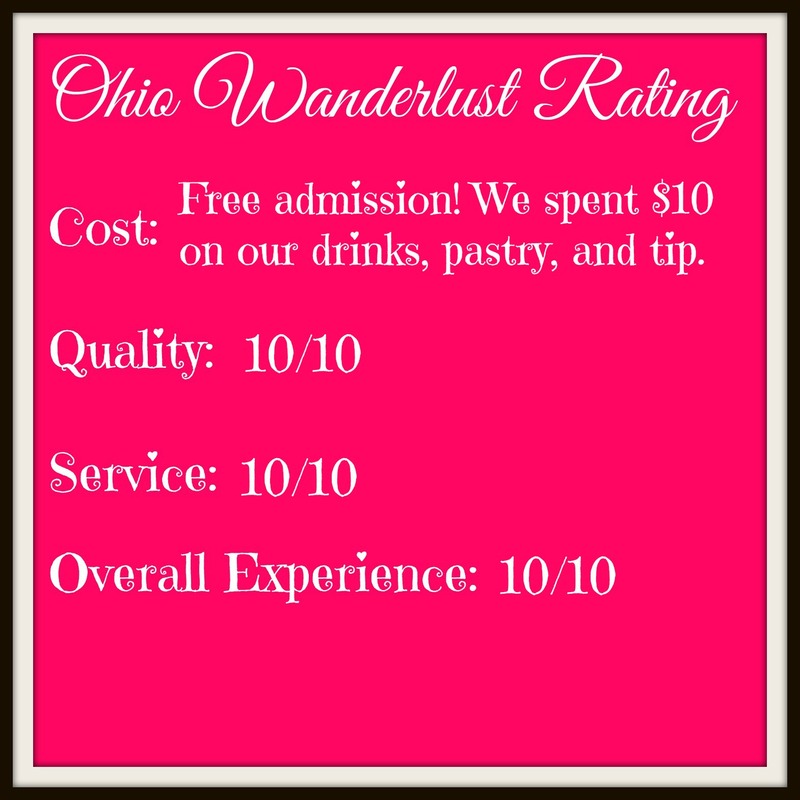 Also on site was the Pierogi Lady, pastry vendors, sandwich vendors, clothing vendors, etc. Downstairs there was a bocce tournament going on, Dave wanted to spend as much time as possible watching the bocce tournament. There was also a kids craft area set-up downstairs. These two budding artists worked really hard at home to create adorable (and pretty accurate) Kurent masks. Eventually I coaxed Dave back upstairs where we ordered a krofe, which is a traditional Slovenian donut which has not been filled. After we ate our krofe, it was time to make our way outside to get ready for the parade. Not to be confused with the two days before Kurentovanje which were unseasonably warm, the cold weather was out in full force yesterday for the parade down St. Clair Ave. Many community groups took part in the parade displaying their community and Slovenian pride. The grand finale of the parade was the Kurents coming down the street to a delightful clanging of their bells. When Krampus is afoot, you also take a picture with Krampus. Krampus is the European companion to St. Nicholas. Rather than bad boys and girls receiving coal, they receive a punishment from Krampus. Cleveland Kurentovanje was expecting 8,000-10,000 people to attend yesterday's festivities. After the parade the party headed back inside with more food, music, and dancing. Followed by an after party down the street at Sterle's Country House until 10:00 p.m. We had another event to attend down the street, so we left Kurentovanje around 1:00. We had more fun at Kurentovanje than we've had in a long time. I am marking our calendar so that we can attend next year with a group of friends. 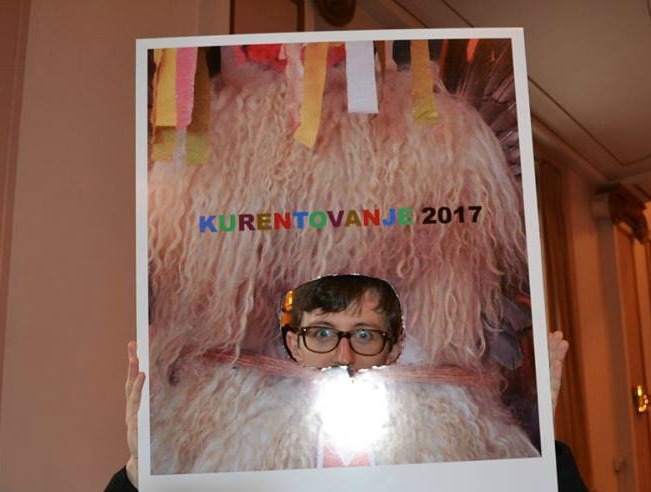 On Friday the first ever Cleveland Kurent Jump was held at a Cleveland brewery to kick-off Kurentovanje and we will be attending that next year as well if it's held again. 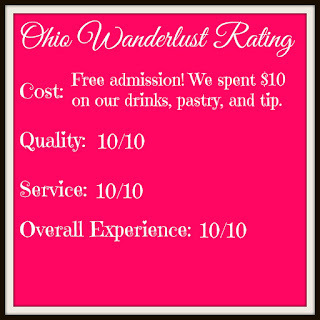 Everyone we spoke with was so friendly and welcoming. We had a blast and cannot wait to attend the 2018 festivities.